Last night in the chat-box we received a question why there is a published review in case a program has become a scam. This question makes sense and I would like to write a comment about this topic. Usually, I review program whenever it has been approved and started paying. Of course, it would make sense removing a review for all HYIP’s that become a scam. On the other hand, old reviews are a good read in case we notice that there is a HYIP on the monitor with the same name as previously reviewed HYIP. However, for the first-time reader, this question totally makes sense. Moreover, I would like to thank you to all for participating in the chat conversations! I would like to move on to the main topic of this review. 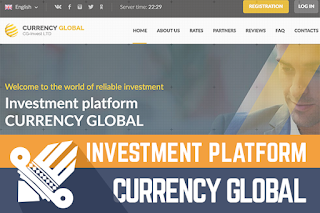 It is a HYIP called Currency Global, which has joined Sticky Listing on DavidNews.com 8 days ago. At first, this program looks like a mid-term program with average rates. Now I have reinvested in it $200 and will keep you updated on the payment status of this program. Additional comment on the opening paragraph – today is the 30th November and Currency Global has status “Paying” on our monitor. Keep reading to find out more about its features and investment plans. To help saving time for all those potential investors being in a hurry I would like to give a brief introduction to interest rates. Currency Global has 3 investment plans with 2, 2.5 and 3% interest rates. The higher interest rates the higher the minimum entree deposit. For the first plan it’s $10 but for the second one $1000. A Large difference, right? However, it makes sense to adjust interest rate according to minimum entree fee for each plan. I find it odd sometimes when there is a huge difference between interest rates and similar minimum deposit for all plans. Keep in mind that deposit will be locked in forever for all three plans. Therefore, it’s important to understand when will be the break-even point and how much time it takes to generate the desired net revenue. The most realistic plan is the first plan with 2% daily rate and a minimum deposit of $10. Keep reading to find out more if these plans seem interesting to you. Currency Global legend is not 100% clear to me and I would like to avoid any interpretations. “The company's income is formed by investing in exchange-foreign operations through points and express-exchange terminals located in more than 20 countries around the world”. In the meanwhile, “The Currency Global platform provides an opportunity for individuals to directly participate in the investment activities of CG-Invest LTD”. These are quotes from the “About us” page. Feel free to check it and find out more. Currency Global is another company that provides UK registration certificate on the website. This must be perceived as homework and is not any guarantee that your deposit is safe and will make a profit. The website of Currency Global most likely has a unique design and is custom built. Overall impression of the visual appeal is very positive and professional. Moreover, we can find all major information on the homepage within a few scrolls – what is it about, investment plans, calculator, affiliate program information and payment options. Moreover, it was built with mobile users in mind. The website is available in two language versions – English and Russian. Currency Global has social media accounts on Facebook, Vkontakte, and Twitter. The first post on Facebook was posted on 22nd September. In the meanwhile, the overall amount of likes for posts is very low. However, it has managed to attract around 2100 likes. On Twitter we can see a similar situation but 2600 followers. Vkontakte profile has managed to gain 5000 followers. In fact, I noticed the highest activity on Vkontakte (social media for Russian speaking audience). However, I would be very cautious making any assumptions based on the social media activities since we all know that there are online services offering to buy followers. The admin has invested extra effort to structure FAQ page content. Often, we see a large list of questions and answers without any structure, which is difficult to use in case you want to find an answer quickly. Minimum amount to withdraw is $0.1 and there is no extra fee for withdrawals. The withdrawal of funds is automatic and should be complete with a minute. Currency Global accepts the following payment options for adding balance: Payeer, PerfectMoney, AdvCash, Bitcoin. Moreover, it’s possible to withdrawal in rubles using YandexMoney, Payeer and AdvCash. Investment plan called “Start” with the most affordable minimum deposit requirement of $10 and 2% daily rate would reach the break-even point in term of 50 days. Therefore, it requires another extra 50 days to make a net revenue of the same amount was deposited. For example, $200 deposit is making $4 a day. It takes 100 days to generate the net profit similar amount to the deposit. It’s quite a bit but the rate seems realistic compared to several previous mid-term programs with ludicrous rates. My opinion about this program is very neutral and I couldn’t find anything to be picky about. Of course, we can blame them for the social media marketing approach, which doesn’t seem to be organic. I would call it a classic mid-term program with standard rates. The good thing - deposit is not returned, which makes it easier for admin to predict the cash flow. However, as usual, the future of this program depends on admins will and greed. Therefore, if you ever decide to make any investments, don’t invest more than you can afford to lose! Have you already made an investment in Currency Global and have anything worth sharing? Please drop a message in the chat box to share your experience!